I realize that he’s really still not broad enough to be considered mature. But he was in the junior class. But, he goes to group, because there are no other DSF in the show. So he gets the win in the group, so that’s kinda nice. 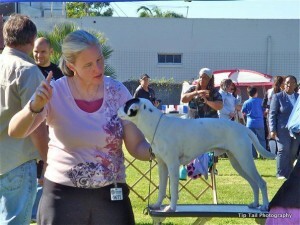 He beat out a Parson Russel Terrier on Saturday for his win. I just hope it’s his championship. I’m really not big into conformation, and I was so stressed over the weekend, that I really hope he’s finished! And I get so tired when I’m stressed, but I don’t think I need any conjugated linoleic acid to help me lose weight, so that’s good. But I do want to take some serious down time next weekend to relax and get myself back together again! 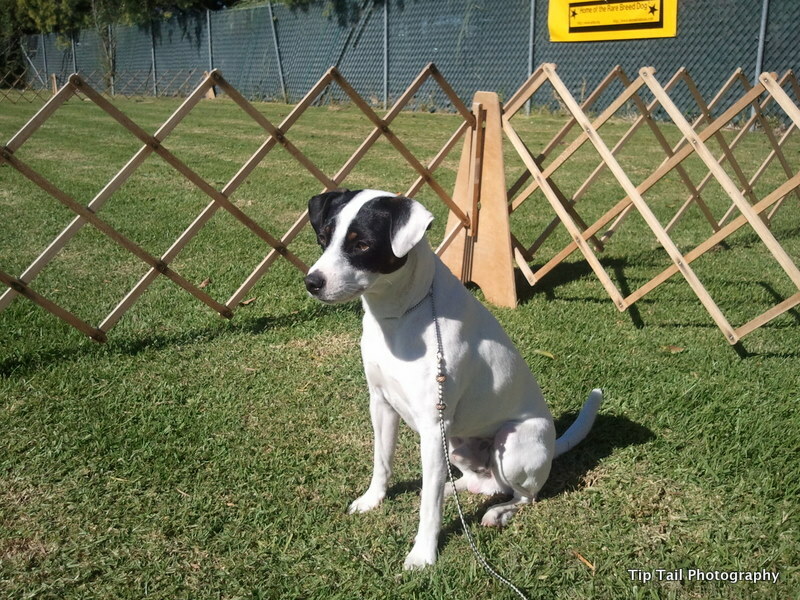 So Saturday Jet and I went to the Danish-Swedish Farmdog National Specialty in Claremont, California. 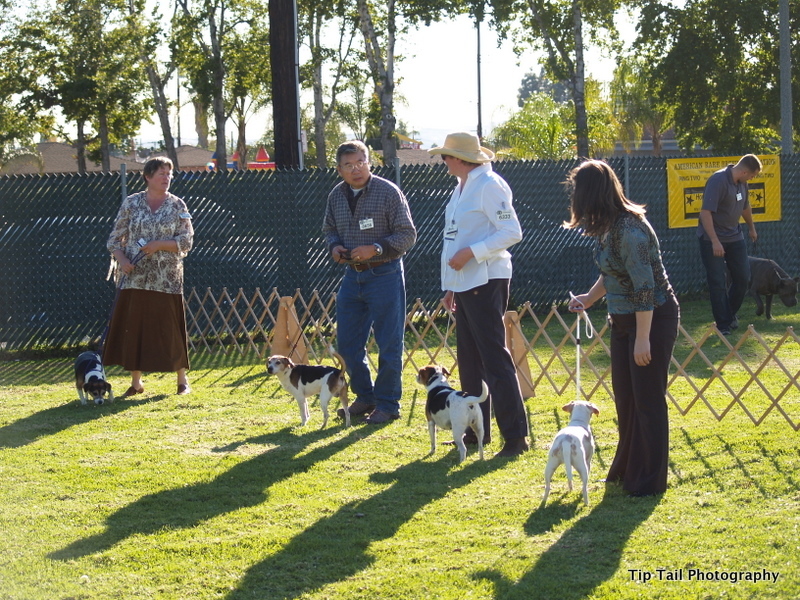 Since the DSF is not an AKC recognized breed, the specialty is held in conjunction with an American Rare Breed Association (ARBA) show. 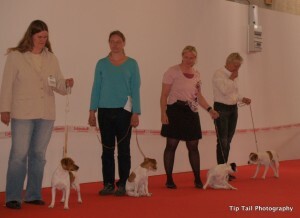 The DSFCA flew in a Danish Judge to judge the Farmdogs for their show. 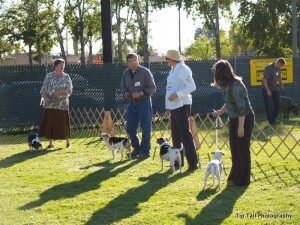 I went last year… and Jet won Best In Show puppy last year. I was proud of him. He was too young to get any points though. As he was under six months old. 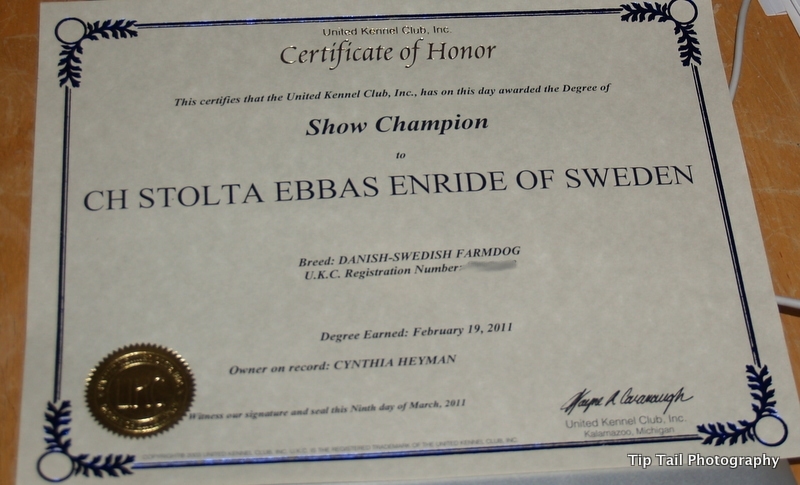 Jet Won A Blue Ribbon At The World Dog Show! The World Dog Show was really fun. 🙂 Here are some pictures, they are on Facebook but anyone should be able to see them. I’ll load up more pictures, and videos, when I get home. 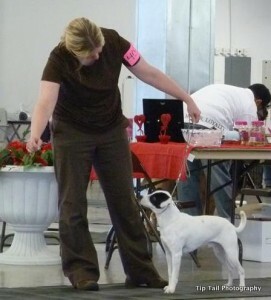 And yes.. Jet did get a blue ribbon! LOL but it Denmark blue isn’t first place. There are various ratings, Excellent, Very Good, Good, and Satisfactory. The blue is for Good. So he did better with this judge then last Friday. But he’s still young, like I said, and he will grow into his Farmdog-ness in a year or two. I’m not worried. I love him just the way he is! 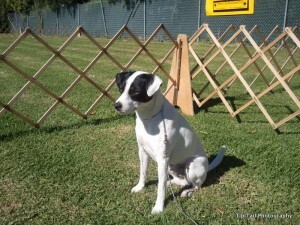 A very cool thing is that Jet’s littermate got an Excellent rating and even placed in this class! He got 3rd place! That’s so awesome! It’s not an easy thing to place with so many dogs. 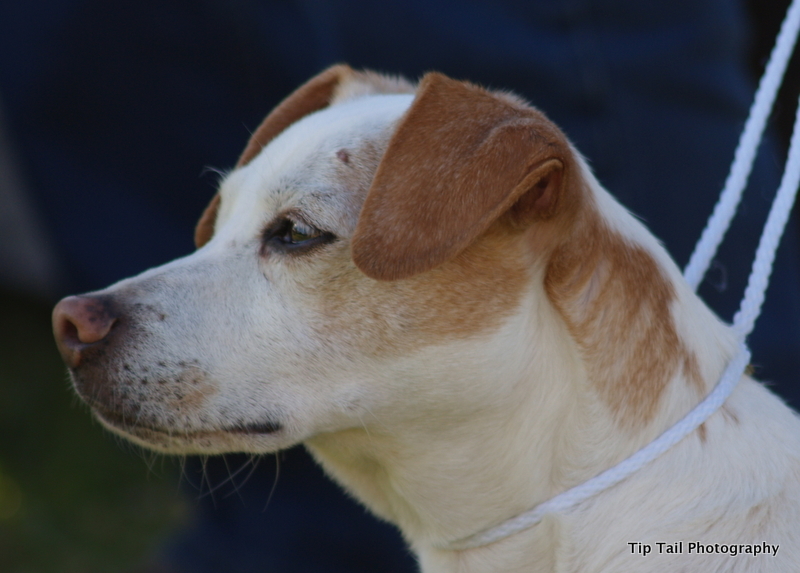 And Caesar, another of the Stolta Ebbas dogs, who is 2 years old and was in Open Dogs, he got 2nd place in his class! His mother is Jet’s grandmother… I believe, though I’ll have to double check that later. 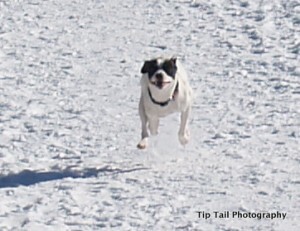 2nd place in The World Dog Show is a HUGE deal so we were all thrilled and excited! It was a fun day. I bought a lot of t-shirts for friends… and some things for Jet and some various and sundry other things. It was a lot of fun, I had a blast. 🙂 I’m so glad that I came! 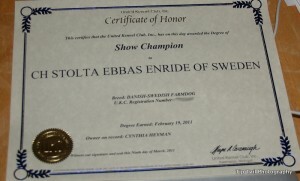 Author CynthiaPosted on 27 June, 2010 5 February, 2014 Categories JetTags Conformation, Jet, Travel4 Comments on Jet Won A Blue Ribbon At The World Dog Show!